Beautiful fashion shoot at l'Hôtel du Cap-Eden-Roc. Chanel showcases their new 2012 Spring campaign, photographed by Karl Lagerfeld at the Hôtel du Cap-Eden-Roc. The famous hang out of the 1960s jet set, Hôtel du Cap-Eden-Roc continues to be a draw for the well-to-do. Models Saskia de Brauw and Joan Smalls pose near the ocean at France's Hôtel du Cap Eden Roc for Chanel's 2012 Spring campaign. Captured by Chanel's creative director Karl Lagerfeld, the black and white photographs feature these gorgeous models striking athletic poses on gymnastics equipment, but it doesn't look like they're breaking a sweat. Rather, they look fashionable and high-class as they model the label's lightweight dresses and outerwear. 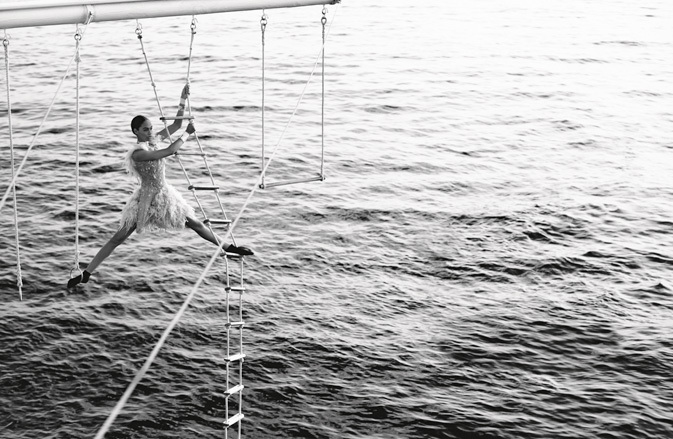 With the gymnastic fashion shots for its 2012 Spring Collection, Chanel continues to raise the bar on high fashion.